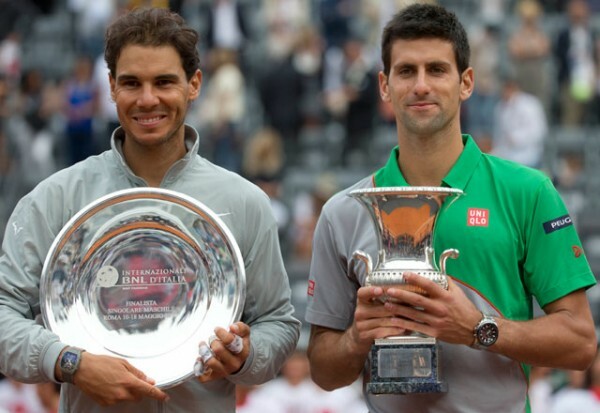 We’re not used to seeing Rafael Nadal lose on clay so much, even if it is against Novak Djokovic. The Serbian star and number two in the world beat Rafael Nadal for the second time this season in a Masters tournament final, this time claiming the Italian Open in Rome to make it his third ATP 1000 title, and maybe placing himself as the favorite to win the Roland Garros for the first time in his career. Nadal isn’t used to losing on clay, and certainly not so many times. Still the world’s number one, he did head into Rome after winning in Madrid, which was his first Masters title of the season. He struggled all through the tournament in Italy, and lost to Novak Djokovic for the second time this season, making it his third loss on clay (adding to the defeats in Barcelona and Monte Carlo to David Ferrer and Nicolas Almagro respectively). This heart on the court is for you. It’s also a special dedication to my country, which is suffering a lot right now. My heart is with them. I’m trying to contribute in my own way. These are very critical times for our country and our people. But we’re being united and this win and this trophy is dedicated to them. This match didn’t go easy for Djokovic, dropping the first set 6-4 before winning twice 6-3. However, he has won four consecutive matches against Nadal and beating him on Clay for the first time since Monte Carlo in 2013. He still hasn’t beaten him on the clay of the French Open (only one player actually has), but this sport is about psychology as well as endurance and skill, and like in 2011, few would argue about the edge Djokovic has at the moment. Then comes the talk about beating Nadal in a five set match, which is a completely different story.But Nadal didn’t look like he was growing any stronger with the match carrying on. His shot making was all over the place while Djokovic handled everything thrown at him before dishing out his own sort of attack, which crippled Nadal, who didn’t move as well as he did in previous tournaments. We’re on the verge of the end of the top 4 era. Stanislas Wawrinka proved that in Australia and when he won the Masters in Monte Carlo against Roger Federer, who really is playing on the final fumes of his career – sometimes brilliant, but never too scary, even if he has already beaten Djokovic this season on clay. If you combine the current mental, physical and skill set each of the favorites has to offer, don’t look any further than Djokovic in order to find the best player in the world right now, and the favorite to win the French Open.